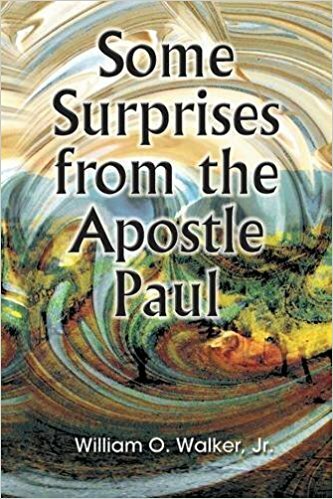 Some Surprises from the Apostle Paul by William O. Walker, Jr. contains an interesting chapter about interpolations. Walker does not agree that most scholars should remain sceptical regarding many proposed interpolations in Paul’s letters. Walker points to two reasons we should expect to find interpolations in Paul’s letters. Scholars have identified numerous interpolations in other ancient texts — “Homeric, Classical, Hellenistic, Jewish and Christian.” We know of interpolations in letters by ancient philosophers to their followers. Even in the Gospel of Mark we have the little disputed interpolation of the final chapter, 16:9-20; and in the Gospel of John there is the episode of the woman taken in adultery found in 7:53 – 8:11. And in the gospels of Matthew and Luke we find that huge chunks have been interpolated into the gospel of Mark. So if we know for a fact that texts were very often expanded with inserted material then we should surely be surprised if Paul’s letters proved to be the exception. Apart from fragments our oldest manuscripts of the letters date from around 200 CE, and these surviving manuscripts contain variants. At best we can only make educated guesses about what the original letters of Paul looked like. All we know is what they looked like from around 150 years after Paul’s time. The church did not preserve individual letters. It only collated collections of letters that were assembled and distributed under the name of Paul. We do not know how these collections came to exist, whether by informal sharing of letters among churches or by a deliberate process of a particular collector. The early collections “cannot simply be equated with what Paul wrote (or dictated).” In 1 and 2 Corinthians Paul refers to other letters we no longer have. On the other hand we know the collections attribute letters to Paul that most scholars believe were not his: Hebrews, 1 and 2 Timothy, Titus, Ephesians, Colossians, 2 Thessalonians. Most scholars further believe that 2 Corinthians is a composite of several letters. And in creating collections it is very likely that sometimes connecting phrases would have been added. We do not know what letters were available to the collector(s) at the beginning or what their condition was. It is easy to imagine non-Pauline letters being confused with Pauline ones and collectors erring on the side of caution in making their decisions. The time the letters were being collated was a period of fierce controversy among Christian factions over Paul’s teachings. Marcion accused his rivals of adding to the letters passages to suit their own arguments while those rivals accused Marcion of deleting passages he found inconvenient. It is quite reasonable to suppose that passages were at times added to the letters so they met the evolving needs and circumstances of the church. Manuscripts available to us vary in their readings. While many variations are simple copyist mistakes, some are evidently added to support doctrine (e.g. the Trinity) or to “clarify” a passage. We can identify these sections by their appearance in some but not other manuscripts. That such variants exist in the manuscripts post 200 CE only gives us more reason to assume that there was similar variation prior to that time. We do not know what became of the original letters or of the earliest copies of those autographs. Among possible explanations is one that suggests they were deliberately suppressed as defective. Keep in mind we are in a period of intense controversy over Paul. Longer versions would most likely be preserved over shorter ones for fear of losing authentic material. Furthermore, despite the many variants among the surviving manuscripts, these documents are overall “remarkably similar” so they may well be the product of an attempt to standardize the collections. Our ignorance of the state of the letters prior to 200 CE may itself be evidence that the earlier letters differed significantly from the versions we now have. Marcion’s shorter versions, after all, no longer survives. Should historicists play the “interpolation card” against mythicists? This is the common objection most times an interpolation argument is raised. The objection can easily be parried, however. What we need is a “rigorous application of [valid] criteria”. When we follow stringent rules we may sometimes end up setting aside passages that we wish Paul had written. The criteria that are used to deny the authenticity of passages ordering the silence of women in the churches or portraying Paul as an antisemite or addressing the baptism of the dead, for example, also deny to Paul the famous “love chapter” of 1 Corinthians 13. Posted on 2017-05-26 10:01:13 GMT+0000 by Neil Godfrey. This entry was posted in Paul and His Letters and tagged Interpolations, Paul and his letters. Bookmark the permalink. As we have no absolutely authentic writings by Paul how can we be sure what, if anything, he, if he existed, wrote? There is literally nothing to compare the claimed writings to if the earliest versions are in disagreement or are incomplete. Without external corroboration we cannot be sure of any of the writings of Paul, but the facts people were forging in his name and that even the conflated, edited, interpolated and redacted still read more naturally as about a cosmic Christ suggests a real writer whose cult was far removed from proto-Orthodoxy too well known to be completely gainsaid, only corrupted and tamed. If the gospels are corrupt, why should Paul’s letter be regarded in any more favorable light? And if the claims about Marcion finding them are true, he may well also have written them while he was eating his dinner. 90 minutes after the Titanic hit the iceberg I doubt there was anyone who actually believed the ship was not going down. The Paulina represent a special case where redaction & interpolation should be considered the rule. The unknown provenance of the Apostolikon which appears suddenly and of which almost a third is considered inauthentic; the clear indications of compilation within letters and derivations between letters, the known history of sectarian contentiousness & counter-accusations of ‘fiddling’, the perplexing schizophrenia of Pauls’ christology and antinomianism — all point to documents that have been cobbled together, torn apart, reassembled, augmented and pruned many times over. When I consider the Pauline epistles, I always think of the Uranian moon, Miranda, whose surface is a crazy patchwork of materials, the result of gravitational forces which have caused Miranda to be repeatedly torn asunder and then re-coalesce. This is something I have been thinking for a while. People pick nits over the “James, the Lord’s Brother” passage, when we don’t even know when or where or by whom it was written. We’re arguing over esoteric meanings of passages when we don’t have a clue if they’re even original to the text or comport with the authors thinking. It only takes about 3 fairly obvious interpolations for Paul to be 100% about a celestial Christ with no Earthly moorings whatsoever.